Thanks to movies like Office Space and Up In The Air, if a company hires consultants, it doesn’t send the best message to their employees. A lot of times, their initial reaction is to think they’re not performing well enough or that the company is downsizing. In reality, though, most companies hire consultants to augment their employees’ efforts, not replace them. Consultants might get a bad rap from time to time, but, in general, they’re more like a helpful advisor than an heir apparent. If you’re interested in becoming a marketing consultant, here’s a quick rundown of what marketing consultants are, their core responsibilities, and their average salary. Whether you're working on a team project or defining goals for an entire company, it's critical your employees are on the same page when it comes to terminology. "Goals" and "Objectives" often seem like two interchangeable phrases. "We have ambitious goals for 2019," you might tell your marketing team, following up with, "Our objectives are aggressive, but entirely possible." When used in a marketing context, it's easy to misconstrue goals and objectives. To ensure efficiency and unity, then, it's vital your employees are up-to-date on the two terms you likely use when outlining your quarterly and yearly strategy. Here, we'll explain the difference between goals and objectives to make sure there is no ambiguity when it comes to your long-term and short-term marketing plans. Goals are undoubtedly critical to your business's success. Ultimately, your company's goals need to align with your vision and purpose, and propel each employee's individual actions and decisions. Here's where objectives come into play -- objectives are essentially the measurable actions you can take to achieve your overall goals. Typically, you'd use the S.M.A.R.T. criteria to define and measure specific objectives. "Create a more inclusive workplace culture" is an admirable and important goal to have, but it's vague and too broad to measure -- does "more inclusive" mean one diversity and inclusion panel discussion, or does it mean a 10% increase in women in leadership positions? Ultimately, your objectives will help your employees understand exactly what you expect from them. For instance, let's say you inform your marketing department that your overall goal is to "grow international brand awareness". Now, when your social media marketing manager is crafting her quarterly video campaign, she'll think to herself -- Hmm. How can I increase international brand awareness? She can cater her objectives to fit company goals, as well as her own personal vision. Perhaps she decides, "To demonstrate my success at increasing international brand awareness, my objectives for my video marketing campaign will be a) 10% of all form submissions come from outside the U.S., and b) an increase in engagement from Spanish-speaking Facebook fans by 5%." Your social media marketing manager can then use her unique objectives to measure whether or not she's contributing to the larger company goal of increasing international brand awareness. As you can see, objectives can be uniquely tailored to fit each departments' needs, and allow for a large amount of autonomy. By instilling clear and firm company goals, you can feel confident that your employees are all working in the same direction, but taking largely different steps (e.g. objectives) to end up at the same finish line. There's one more term differentiation you need to know -- objectives versus strategy. Referencing our example above, let's say your social media marketing manager decides one of her objectives will be "an increase in engagement from Spanish-speaking Facebook fans by 5%". This is aligned with your company's goal to increase international brand awareness. A strategy, then, tells your employee or team how she can accomplish her objectives. For instance, your social media marketing manager might decide to focus her paid efforts on Spanish-speaking countries, using Facebook's location targeting features. Alternatively, maybe she decides to cultivate partnerships with international companies, and posts videos in Spanish on Facebook specifically highlighting the work of those international organizations. Both of these options are examples of strategies. Her strategy might change over time. She might decide her paid efforts aren't working, and try something else. Ultimately, however, her objective (increase engagement from Spanish-speaking Facebook fans by 5%) should remain the same. Let's say you're tracking the performance of your pay-per-click (PPC) ad campaigns. After all that hard work and PPC strategizing you put toward improving your performance grade, how's the traffic looking? Is it a steep climb, or are you unimpressed with the result? Some of us come off as natural all-star rock climbers, while others are left frigid, timid, and stuck to the crevices of the wall. What's the secret? As with most things: proper training. And if you don't have any, don't worry -- there's still hope. 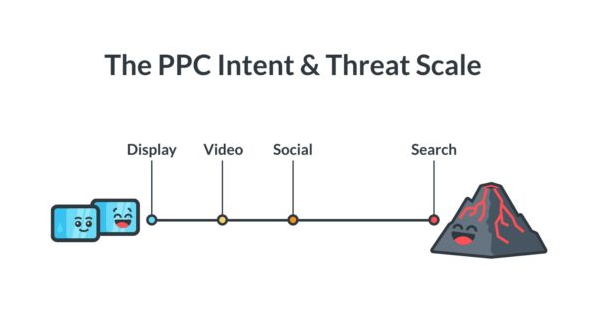 We here at KlientBoost have partnered with HubSpot to bring you some rock solid tactics that you can use to get a grip on the whole PPC thing. Below, you'll learn how to run a PPC campaign on a few of the most common platforms, followed by five tips for how to maximize your campaign's performance. 1. Choose a platform for your PPC campaign. Your first step in running a new PPC campaign is to decide on which platform to run it. Google Ads are perhaps the most popular PPC campaign among today's marketers, but did you know social networks like Facebook and Twitter also offer pay-per-click advertisements? Here's how each of these common ad platforms work. Facebook Ads allow you to place "sponsored" posts on the newsfeeds of users who identify with specific audience characteristics set by you, the advertiser. Using this platform, you can choose your ad's objective -- including brand awareness, website traffic, and store visits -- your target audience, budget, and ad format. Facebook will then place your ad on the newsfeeds of users who match your choices, and charge you every time this ad is clicked. Twitter Ads work similarly to Facebook Ads. Using Twitter's PPC ad platform, advertisers can choose between eight different advertising objectives -- including app installs, new followers, tweet engagements, and website traffic -- as well as their target audience for the ads they run. Twitter will then "promote" your post on the newsfeeds of users who match your choices, and charge you every time this ad is clicked. Google Ads allow you to pay for high-ranking real estate on Google's various web properties -- including search engine results pages (SERPs). Your campaign can take the form of a Display Ad, a Search Ad, an App Ad, or a Video Ad -- the latter of which places your video on YouTube. 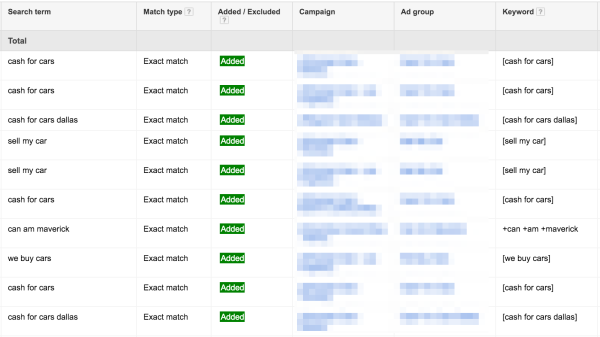 These PPC campaigns allow you to set your ad budget, customize your audience, and/or commit to groups of search terms on which you want your search result to appear. Google then charges you each time this search result is clicked. For the purposes of explaining how to run a PPC campaign, we'll focus on Google Ads in the steps below. 2. Choose a type of ad to invest in. These banner ads can appear anywhere in the Google ecosystem, such as Gmail, YouTube, and similar domains within Google's "Display Network." This ad type is what you most likely associate with PPC. A method of search engine marketing, Google's Search Ads show your chosen landing page in the form of a hyperlinked search result when users enter specific search terms. You can choose these search terms when setting up your Google Ads campaign. These ads help to promote an app you've developed for sale on Google Play, the company's app marketplace. Using this ad type, Google automatically synthesizes each ad's artwork using the contents of your app's download page. Google then runs these ads in your chosen languages and locations. App Ads can appear across the Google ecosystem, including Google Search, Google Play, and YouTube. Google's Video Ads appear across YouTube and certain Google partner platforms. Advertisers can run their video ads before, during, or at the end of various videos that share a similar audience with the advertiser. 3. Determine your ad budget and bidding strategy. Your PPC campaign budget will dictate how much you're willing to pay for the clicks you get on your ad placements. On Google Ads, you'll set a daily budget, whereas platforms like Twitter and Facebook will have you select the increments you want your payments to be in. So, for example, if your marketing team is allotted $1,000 for PPC, you'll first want to find out how many campaigns you're running. Let's say that number is eight, which would theoretically make each campaign worth $125. Having determined how much of that budget is available to each campaign, you'll then divide this number by the number of days you want this campaign to run. If you want it to run for 14 days, your daily budget would be roughly $8.93/day. However, there is another element of budget-setting in the world of PPC: Not all topics and audiences are equal in value. This means certain interests, audience segments, and especially search terms will cost different amounts per click. Cost-per-click (CPC) bidding: You pay Google each time someone clicks on your ad. Cost-per-thousand viewable impressions (vCPM) bidding: You pay Google for every 1,000 times your ad appears to users. Cost-per-acquisition (CPA) bidding: You pay Google each time someone clicks on your ad, but the amount you pay is automatically optimized against how much it costs you to "acquire" a customer -- or similar conversion behavior -- from your website. Cost-per-view (CPV) bidding: You pay Google each time your video ad is viewed, clicked on, or otherwise engaged with on YouTube. Learn more about Google Ads bidding here. 4. Customize your target audience, interests, location, and search terms. In any PPC platform you choose, you have ability to choose who you want your ads to reach. The "who," in the context of Google Ads, includes your audience's location, interests, app they use, and of course the searches they perform. You can also create custom audiences each with their own "custom affinities" and "custom intents" to help you further tailor your PPC campaign to the right people. Once you've established your target audience, you'll top it all off with specific search terms, whose SERPs you want your ads to appear on (this is assuming you're creating Google Search Ads). Be careful how many keywords you choose for each ad. Contrary to what Google Ads might suggest, the more keywords you choose to place an ad on, the higher the chance you'll wind up in front of the wrong audience. Start with just one or two keywords that are high in search volume and match the intent of your target visitor (we'll talk more about intent in step 6, below). 5. 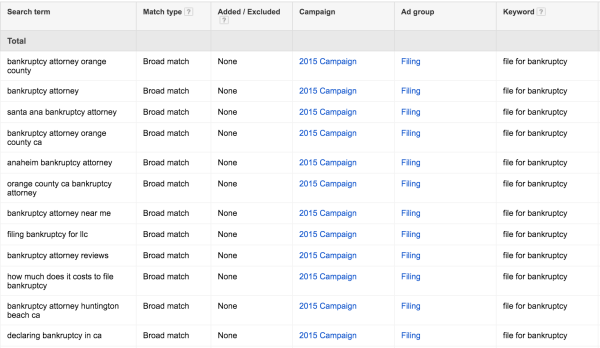 Organize your campaign into "ad groups." Assuming you're creating Google Search Ads, you'll take the keywords you selected in step 4, above, and put them into "ad groups." If you're creating PPC ads on Twitter, you'll use a similar campaign framework. If your PPC ad is promoting the sale of ice skates, you might start with the search term "ice skates." Then you discover the search term, "ice skating," and decide to add it to your PPC ad. The second search term, "ice skating," weakens the ad group. Why? While "ice skates" appeals to those who are looking for the ice skates themselves, "ice skating" stretches your audience to include those who might be looking for ice skates, ice rinks in their area, or even instructions on how to start ice skating -- searches that limit the chances you'll find interested customers among the people who click on your ad. If your PPC ad is promoting the sale of ice skates, you might start with this search term and decide to branch out into other search terms that include this term, but carry different or additional wording. For example, using Google Ads features like Modified Broad Match, you can also pick up searches like "skates for ice rinks." Using Phrase Match, you can pick up searches like "ice skates for hockey." This way, you can diversify your ad with more search terms without sacrificing the interests of your audience. 6. Identify and design landing pages that match the intent of each search term. It's not a good idea to make the destination of your PPC ad your website's homepage. This only serves to confuse your visitors and, ultimately, scare them off. Whether you choose from an existing webpage on your domain, or design a new one, make sure you're sending your visitors to a destination that helps them find what they're looking for. This is known as "intent match," and search engines like Google take it very seriously. Let's go back to our "ice skates" example from step 5, above. If someone searches for "ice skates," clicks on your ad, and they're taken to a page on your website offering ice skating lessons, you haven't matched the intent of their search -- even if this page is set up to convert visitors using a signup form for paid skating lessons. These people are looking to purchase ice skates, not lessons. Therefore, a better destination page for this ad would be a product browsing page with all of your available ice skates listed and optimized for purchasing. 7. Track your PPC campaign's performance in context of your larger marketing initiatives. The platform on which you're running your PPC campaign will have an analytics dashboard where you can track how your ads are performing. Take full advantage of it -- here, you get to see the fruits of your labor. This includes the traffic you're receiving to your ad's landing page, how much you're spending, and even how well this traffic is converting into leads or revenue. With this data, you can find out if you're getting the bang for your buck. But don't be afraid to consider a more holistic view of your PPC ads' performance, as well. By integrating your Google, Twitter, Facebook, or even LinkedIn ad campaigns into your company's marketing software, you can associate these PPC campaigns with the rest of your marketing initiatives -- helping you determine how the business is performing as a result of your paid efforts. 1. Include "negative keywords" in your PPC campaign. Just as there keywords and search terms that dictate where each PPC ad you run will appear, there are keywords that you can specifically omit from your campaign. These are called "negative keywords," and they prompt your ad platform to avoid placing ads on results pages that are produced when a user enters these search terms. 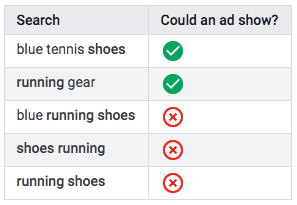 In the example group of search terms, above, an advertiser on Google Ads has elected to place their ad on the SERPs of the search terms, "blue tennis shoes" and "running gear" -- but not "blue running shoes," "shoes running," and "running shoes." This allows the advertiser to avoid audiences who are searching for these products, since they're looking for something similar but that the advertiser doesn't actually sell. Learn more about how to select negative keywords here. 2. Use the "Iceberg Effect" to gain more control over your PPC campaign. The search terms that you end up paying for and the keywords that you're actually targeting don't always line up the way you want. Not being in control of all those search terms? Not ideal. 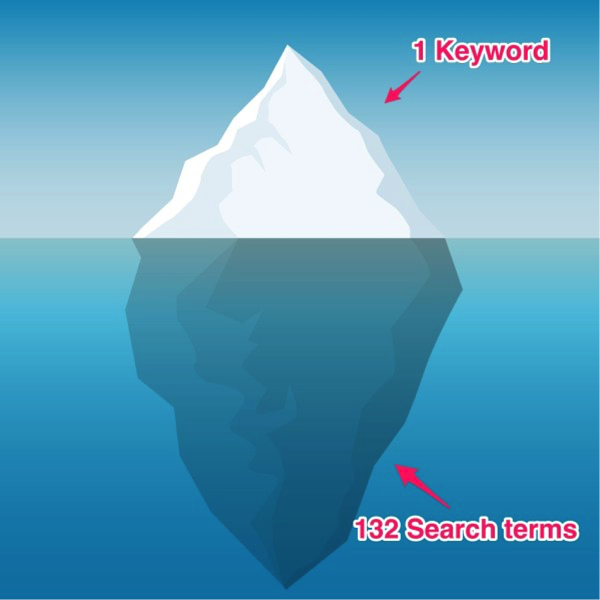 With a search term to keyword discrepancy ratio of 132:1, it can be challenging to continually improve your clickthrough rates and lower your cost-per-click averages. How do you gain control of this icy situation? We use something called Single Keyword Ad Groups (SKAGs) to shoot for a 1:1 ratio of search terms to keywords, allowing for more control over the entire ad group. It's not that any of these search terms are bad, it's that each search term has a different conversion and sales rate. And by keeping them as search terms and not turning them into keywords, you will never be able to control them to take your PPC campaigns to the next level. So what does a search term report look like if we use this granular PPC tactic and use SKAGs? Everything in the search term column matches the keyword column. With the SKAGs tactic, you can get super granular and isolate one variable at a time, which means you have more control over your entire PPC account. 3. Keep tabs on conversions vs. sales. With your PPC tactics now upgraded, your PPC campaigns should be driving up conversion volumes and making you more money. But do you know which keywords, audiences, or placements are actually making you money? If you don't track the components of your campaign and attribute them to your sales, you might be missing out on where to focus your efforts. By implementing Google's ValueTrack parameters you can automatically track data within URLs when your visitors convert. When you tie your hidden field sales tracking back to your CRM, you can find out specific details about which leads are making you the revenue (doesn't apply to ecommerce). Hidden form fields can reveal to you things that happen during a conversion, like which landing page URL your conversion came from, where the visitor is located, or what keyword they typed in. 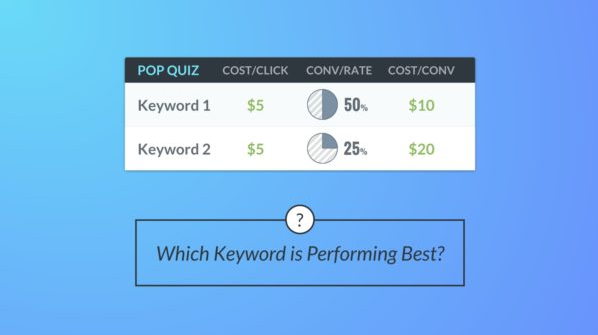 Keyword #1 has a lower cost-per-conversion. Now Keyword #2 looks better, right? 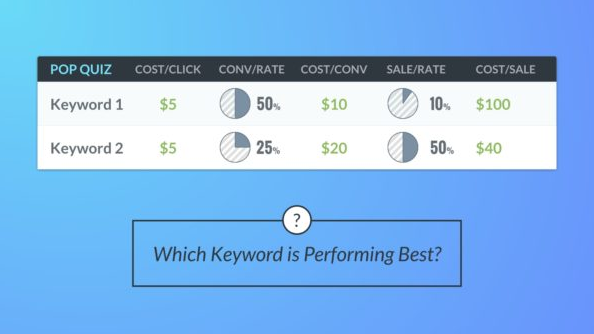 Although Keyword #1 has a lower cost-per-conversion, Keyword #2 has a much higher sales rate, which is making you more money. See the benefits of tracking the sale vs. the conversion? Knowing these types of details can help you understand where you should be crediting your sales success, so you can be more aggressive in bidding on those keywords, audiences, or placements. With this PPC tactic, you can ease up your budget on the areas that aren't contributing to sales, and allocate to the areas that are. 4. Gauge your visitors' intent on the CTA temperature scale. Not all PPC visitors come through to your landing pages with the same conversion intent. There's a temperature scale that varies depending on visitor origin. Knowing where your visitors come from can help you immensely when it comes to matching your call-to-action with their temperature in the conversion funnel. We recommend testing out various CTAs to match the intent temperature of your visitors -- after all, a small CTA tweak could've made all the difference. In short: the warmer your visitor's intent the warmer the CTA can be. Traffic that comes in from the display network will likely respond to colder CTAs, since those visitors are in the awareness stage. 5. Use micro PPC conversions to break down the larger conversion into smaller pieces. As you know, the more granular and detail-oriented you can get with you PPC campaigns, the more control you can have over the success of them. When it comes to conversions, you can break down your larger macro conversion into micro conversions to figure out where your issues are. An effective way to figure out which part of your PPC campaign is causing the conversion bottleneck is to analyze the micro conversions. Let's say that you're running some new Facebook campaigns but for some reason, no one is converting. If you knew, however, that visitors spend an average of four seconds on your site/landing page, then you know that your Facebook ad targeting may be off. Instead of thinking it's the ad or landing page that needs some tweaking, it could be your targeting instead. Time On Site. How long are your visitors spending on your site? If the time is brief, the conversion issue doesn't have to do with your landing page design. The issue is happening in an earlier stage, like in your ad campaign or your targeting options. Scroll Depth. How far are your visitors scrolling down your landing page? If they aren't scrolling down very far, maybe you need to have a shorter landing page where your CTA is above the fold. If they're scrolling pretty deep, it might be a good opportunity to include additional (super legible) offer details toward the bottom of the page. Form Field Completion. Are visitors abandoning your forms? If so, try testing out different formats and include a multi-step landing page with more form fields. Button Click. Testing out different CTA button colors and copy may be the key to your larger conversion success. 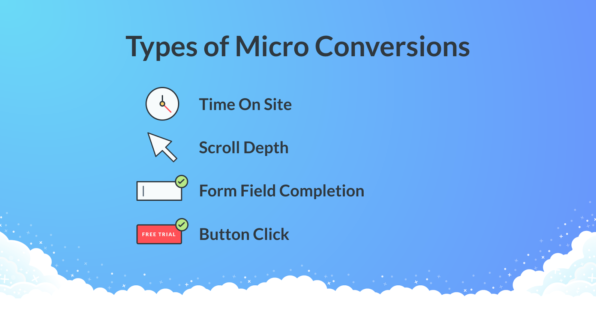 By isolating micro conversions you can zero in on where exactly the conversion friction is located, which can help you alleviate the issues quickly and reach your larger conversion goal. 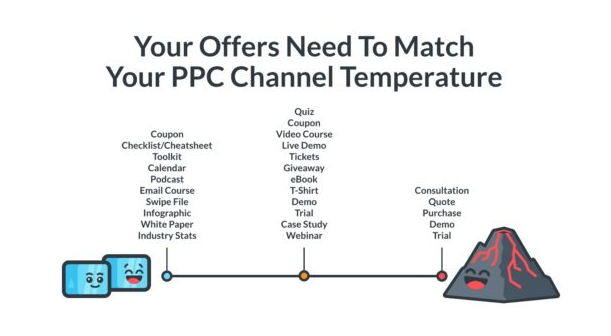 Whether it's addressing the Iceberg Effect, tracking your sales vs. conversions, testing CTA temperatures, or analyzing your micro PPC conversions, each of these PPC tactics can have a significantly positive impact on the performance of your campaigns. And the best part, there's a good chance your competitors don't even know about them. Now it's your turn to up your PPC performance game. With these useful PPC tactics, you'll be climbing your performance incline to the top with utmost ease. Instagram officially has one billion monthly active users -- and 80% of those users follow a business. Your business isn't on Instagram? Well, chances are good that your customer is. So it might be time to start 'doing it for the 'gram'. But, first and foremost, what do most businesses get wrong about marketing on Instagram? They forget how they use Instagram in their own lives! For instance, consider this scenario -- you're scrolling through your Instagram feed. You see your friend's puppy (♡), your friend's engagement photos (♡), a video of Ellen Degeneres dancing (♡) ... and then you see an ad for garden hoses. I'm willing to bet you keep scrolling. But what if, instead of a generic ad for garden hoses, you saw a beautiful shot of a gardener nurturing her garden by watering it? You'd be more willing to like it, wouldn't you? Social media is an innately emotional and human space. You follow friends, you like friends' posts, you follow causes you care about, and you share content with which you identify. Ultimately, it's about a sense of community. Unfortunately, when a brand is "me me me" all the time, they remove themselves from that social community, and accidentally exclude the exact people they want. They make it all about themselves, and steal their audience's attention, rather than earning it. But what if a brand embraced a tone of "us", where they shared content that both you and the brand valued? Well, I'd say that's a whole different experience. So are you looking to start using Instagram as a brand awareness tool? We're #pumped if you are. Here are three hot tips to remember as you get going. 1. Make your mission your message. 64% of consumers choose or avoid a brand based on its stand on a societal issue. Since social media is rooted in emotion and identity, people want to rally around something they believe in. Consider how your brand can inspire your audience and encourage them to rally around a cause. Play your cards right, and they will become brand advocates, telling their friends who also share that mission. 2. People like content that looks like it's from real people. 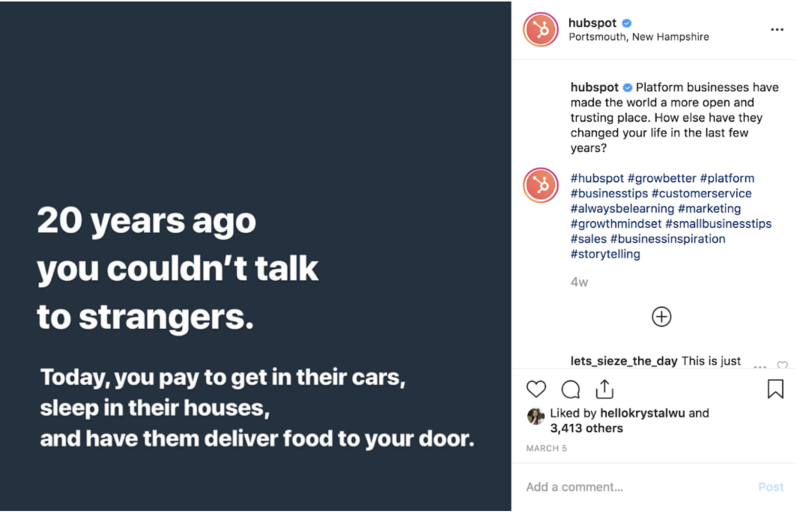 It is imperative that every brand remember what they post on social is invading someone's space that is typically reserved for friends and family. So how can you make sure that your brand is welcome in that space? By taking nods from friends and family. People prefer content that feels like it was made by a person with a heart and soul, versus a corporation. 1. Have an engaging brand voice: Some brands play with how they communicate. Netflix is a particularly good example of a brand embracing a uniquely human tone of voice. From their commentary on pop culture to clap backs, it feels like one of your friend's engaging. And you remember them for that exact reason. 2. Don't overthink production: You've heard us say it before -- content is king. Social is proving this in a big way, as audiences don't seem to mind if something is shot on an iPhone as long as the content is valuable. In fact, we're finding more often than not, audiences actually prefer a lower production value. Why? Because it feels like something a friend of family member could have made. It doesn't have as much of that "big corporation stink" on it. HubSpot has played around with lower production -- like the example below, which was made in Instagram stories. 3. Value on social is a different kind of value. One size does not fit all. When you are seeking brand awareness on Instagram, the value you want to provide is different than the value you would provide at a different stage of the buyer's journey. You want to focus on how someone feels when they see content or engage with your brand. Have you ever heard the phrase, "People will forget what you did, but people will never forget how you made them feel" by Maya Angelou? You should apply this philosophy to your Instagram strategy. For instance, chances are good a free e-book offer on Instagram while someone is on the train coming home won't make them feel too much -- but what if the content was a bit more human? Identity: Does our audience feel seen? Do they feel like we understand them as a person first, customer second? Does it make them scream, "This is so me!"? Informative: Is this something our audience didn't know already, and would care about while browsing on Instagram? Is this helpful to them in a snack-able social way? Will our audience be thankful we shared this content with them? Emotional: Does our audience feel something? Do they care with their heart when they see our content? Lastly, don't forget about Stories! There are 500 million stories every day, and one-third of them are from businesses. Best news of all? The principles we've described above in regards to brand awareness also apply to Stories. To read more on Stories, check out our post Instagram Stories: What they are and how to make them like a pro. 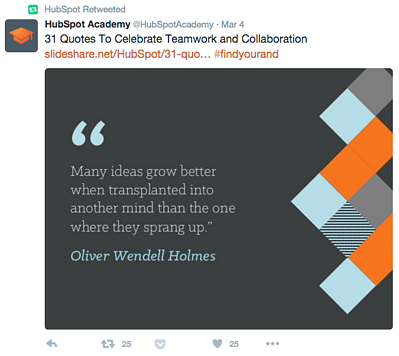 Follow HubSpot’s Instagram page for tips on marketing, sales, and customer service. That’s the average reach of a Facebook post and life of a tweet, respectively. These are networks that millions of people spend time on every single day -- and they seem to offer such slim, fleeting opportunities for brands. But it doesn’t have to be that way. There's a method to turn a paltry social media conversion rate into something that can offer real benefits to your brand. A method that’s helped brands both large and small achieve up to a 68% conversion rate on social. I'm talking about social commerce -- the current best way to make more sales and increase reach through social media channels. Let's take a deeper look about what exactly social commerce is, and the big problems it can solve for you brand. This is not an overstatement: social commerce changes the way brands use social media. Rather than generating interest and directing traffic to your site, social commerce allows brands to sell directly from their social feeds. It effectively reduces the purchase journey down to two simple, frictionless steps. The first is when the user sees the product they want, the second is buying it. It’s important because -- as any commerce pro will tell you -- most purchase journeys suffer from huge leaks. Just take a look at the chart below. It accurately represents how few of your leads turn into customers. By reducing the steps a user has to go through, you can effectively streamline the purchase journey and reduce the possibility of funnel leaks. Just a simple checkout available directly from the user’s Facebook, Twitter, Instagram, or any other social feed. Here’s how social commerce looks in real life. The video below shows a social commerce campaign Marvel ran. When users commented with #AntManandtheWasp, an automated chatbot messaged them to discover their theatre and time preference before processing payment. Over the last few years, the most successful digital marketing has primarily focused on making the user experience more logical and seamless. Shorter forms have a higher completion rate. Auto-fill is becoming commonplace because it generates more conversions. And one-click purchasing is held up as the ideal ecommerce model. Social commerce is yet another example of a solution that plays to the more streamlined needs of modern users. But it’s not only providing a conversion benefit. So the primary benefits of social commerce are the more streamlined purchase journey leading to higher conversions (more on that later). But there’s also an impressive list of secondary benefits. If you’ve been keeping an eye on social media developments over the last year, you’ll know it’s becoming increasingly difficult for brands to stand out. Ad costs are on the rise and algorithm updates are de-prioritizing brand content. If you watch the Marvel gif above again, you’ll notice that users are required to comment on the post to kick off the automated checkout. That comment is key to the secondary benefits. As soon as a person comments to start the checkout, the post is then redistributed to their network, increasing its reach. With each subsequent engagement, reach is yet again increased. Before long, your posts and ads are achieving much high impressions than they would if users weren’t prompted to engage. Social commerce is a great solution for any brand looking to increase social media sales and engagement. It all sounds great, right? But how does it actually work in real life? Well, I've broken down a couple of social commerce campaigns that drove real results to help highlight its use. I’ve tried to pick three examples that not only shows the potential power of social commerce, but also highlight different approaches to implementation. So here’s a quick overview of what I’m going to cover. - The completely digital strategy Marvel used to achieve a 68% cinema ticket conversion rate. - How Ben & Jerry’s moved consumers from online to offline forgetter engagement. - How Nike’s social commerce strategy started in the real world before seeing completion on social media. Marvel, despite being one of the biggest entertainment brands in the world, never rest on their laurels. They’re forever looking for ways to better engage with their customers. And when they took a look at their current channels, they realized their social campaigns were due for an upgrade. The problem with traditional social media marketing is that purchase journeys become incredibly complex and long-winded. Prior to Marvel's investment in social commerce, users would have to go through various steps to make a purchase after viewing a social post that interested them. I had to navigate through nine steps after seeing a cool post on Instagram. Average purchase journeys have enough of a drop-off rate. On social media platforms like Instagram, that drop-off rate can easily become even more exaggerated. Instagram is designed to keep users within the app, so any process that requires users to take multiple steps to exit the app and navigate somewhere else is going to leak leads like no one's business. This step drop-off rate is exactly what Marvel wanted to combat. They wanted to reduce the friction and maintain the experience Instagram users were expecting. The below is one of the real ads they ran to promote Infinity War. You’ll notice users are asked to swipe up, and then comment with an appropriate hashtag. Once they do, an automated checkout bot takes over and asks a few questions that lead them through those nine stages of the purchase funnel in less than a minute -- without leaving the app. Here’s how the chat sequence looked for those engaging with the Ant-Man and the Wasp campaign. This conversational method of driving sales is not only more aligned with the user’s expectations on social, but it also streamlines the purchase journey. Users are kept on the platform they’re engaged with and are able to complete their purchase in a fraction of the time. Marvel results speak to the effectiveness of the campaign. But they also took it a step further. They built a custom audience of those who engaged with the Infinity War campaign and retargeted them with a secondary campaign that promoted Ant-Man and the Wasp. By retargeting an already engaged audience who were comfortable buying through social commerce solutions, they increased their overall conversion rate to 68%. The moral of this story is that your customers are looking for more streamlined purchase experiences. Bouncing them around from one site to another so they can complete numerous steps is too much of a chore, and leads to the terrible social media conversion rates. Whether you’re just starting a new business, launching a new product line, or just need to inject a few new leads into your pipeline, there’s one method that’s more successful than most. Giving stuff away for free. But here’s the thing. Free products will generate a lot of buzz for your products and brand, but they generate zero revenue. You’ve got to have a follow-up sale in the pipeline. Which is exactly what Ben & Jerry’s did when launching a new product -- pint slices. To drive interest and awareness of the new product, they ran Facebook and Instagram ads that were linked to a social commerce checkout. Users who engaged with the ads would receive a chat sequence similar to the Marvel one above. It would ask for their preferred pickup location and flavor. Using that information it would then generate a free QR code which, when taken to the nearest vending machine, would secure a free pint slice. Ben & Jerry’s received huge engagement with this campaign. In addition to moving 5000 samples within 72 hours, they gained 2.2X the customer insights they usually would through a similar campaign. But it’s the insights that were the most valuable. Ben & Jerry’s now had the details of 5000 people who both expressed an interest in the product and had tried it. People who would be the perfect target for the launch of a sales campaign. All they now had to do was run a sales campaign targeting those 5000 people to see a healthy boost in sales. The campaign I’m talking about is Nike’s promotion of Jordan’s through Snapchat. Nike started by targeting an audience they knew would be interested. Basketball fans. Instead of targeting these people with Facebook Ads or another digital channel, they launched a campaign that started at an in person event - the after party for the NBA Allstar’s game. At the afterparty, Nike hid snap codes in different areas of the event space. When scanned with Snapchat, the code would kick off a social commerce checkout within Snapchat. The prize was an (at the time) unreleased pair of Jordan’s. Despite being a higher priced product, Nike sold out of this limited run within 23 minutes. I like this example more because it bridges the offline and online world of sales. Nike leveraged the device we all carry every day. But they did it at a time when interest in the product would be at it’s highest. The fact that this was a campaign type not used commonly also added something of a gasified element to the whole process. It’s a great example of understanding your audience’s desires and how you can best serve them. Social commerce is one of the best ways to simplify the purchase journey. It’s an incredible method to improve sales and connect with a wider audience. People aren’t on social media to do serious research of the products they’re thinking of buying. They’re there to procrastinate, have fun, and connect with friends. The most successful campaigns are those which focus on impulse purchases of products or services that fall in the <$100 range. If you sell $1,000 electronics, this might not be the best method to drive sales. But fear not, there’s still a way to use social commerce in your strategy. In short, you use social commerce to qualify prospects and bring people into the top end of a longer upset funnel. For example, let’s say you deal in $10,000 audio systems. Your audience is made up of audiophiles and music aficionados. Hawking a $10k system off the bat isn’t going to work. But selling a $50 pair of headphones with superior sound quality would appeal to the market and fits within the all-important impulse purchase price point. For those selling high-priced items, social commerce isn’t going to transform your business by driving direct revenue, but it’s going to fill your upsell funnel. It allows you to more easily attract leads who, in time, will spend more with you. Think of social commerce not just as a way to drive sales, but as a method to attract new customers and generate more qualified leads. Social commerce seems to finally be coming into its own. It’s finally providing real, tangible benefits to business beyond the vanity metrics of likes, shares, and comments. But it’s still in its infancy. Over the next five years, it’s a safe bet to assume that social commerce will become a more permanent fixture in the marketing strategy of brands both big and small. If you’ve not yet managed to get your social commerce strategy off the ground, do so. It's already driving great gains for others, but so few are leveraging the strategy that there’s a lack of competition. Now is the perfect time to begin. Here on the HubSpot blog, we’ve written glossary-themed posts that cover some of the core components of inbound marketing. We've covered social media terms, content marketing terms, smarketing terms, email marketing terms, website optimization terms ... heck, even marketing acronyms. Well, we thought it was time to create a blog post that could serve as a holistic marketing glossary -- one that not only defines each term, but also offers some helpful resources in case you want to learn about them in more depth. We hope you can bookmark this post and come back to it whenever you need to. Now, I'm no math whiz, but when you try to make a glossary based on a topic with sub-categories that could be their own glossaries, well -- that’s a lot of gloss. So instead of throwing hundreds of terms at you from all those other glossaries, I narrowed this one down to the top 100 terms that are imperative to anyone learning about marketing. APIs are a series of rules in computer programming, which allow an application to extract information from a service and use that information either in their own application or in data analyses. It's kind of like a phone for applications to have conversations -- an API literally "calls" one application and gets information to bring to you to use in your software. APIs facilitate the data needed to provide solutions to customer problems. HubSpot has APIs that developers use to get information from our software into theirs. It’s important for marketers to understand what APIs can do to factor them in to their marketing strategies. Learn more about how marketers can use APIs here. Blogging is a core component of inbound marketing, as it can accomplish several initiatives simultaneously -- like website traffic growth, thought leadership, and lead generation. It does not, however, do your taxes. Typically, next steps for leads at this stage are a call from a sales rep, a demo, or a free consultation -- depending on what type of business is attempting to close the lead. A web application designed to make it easy for non-technical users to create, edit, and manage a website. Helps users with content editing and more "behind-the-scenes" work like making content searchable and indexable, automatically generating navigation elements, keeping track of users and permissions, and more. A way to display different messaging on your website based on the information you already know about the visitor. For example, you could use Smart CTAs so that first-time visitors will see a personalized CTA (perhaps with a top-of-the-funnel offer) and those already in your database see a different CTA (maybe for content that offers a little more information about your product or service). You can read this post to learn more about dynamic content. Ebooks are a common type of content that many marketers use, often to help generate leads. They are generally a more long-form content type than, say, blog posts, and go into in-depth detail on a subject. Here's an awesome ebook on how to write an ebook (so meta). Evergreen content is content that continues to provide value to readers no matter when they stumble upon it. In other words, it can be referenced long after it was originally published, and even then, it's still valuable to the reader. This post on how to write blog posts serves as a prime example. Facebook is a social network you're likely quite familiar with already -- but it has become so much more than just a platform to publish content and gain followers. You can now utilize the awesome targeting options available through Facebook advertising to find and attract brand new contacts to your website and get them to convert on your landing pages ... but remember, you still need awesome content to do it. Hashtags are a way for you and your readers to interact with each other on social media and have conversations about a particular piece of content. They tie public conversations on Twitter, Facebook, and Instagram together into a single stream, which users can find by searching for a hashtag, clicking on one, or using a third-party monitoring tool like HubSpot's Social Inbox. An inbound link is a link coming from another site to your own website. "Inbound" is generally used by the person receiving the link. For example, here's an inbound link to our co-founder Dharmesh's blog. Dharmesh could say, "I received an inbound link from HubSpot." Sometimes referred to as "keyword phrases," keywords are the topics that webpages get indexed for in search results by engines like Google, Yahoo, and Bing. A person or company who's shown interest in a product or service in some way, shape, or form. Perhaps they filled out a form, subscribed to a blog, or shared their contact information in exchange for a coupon. Generating leads is a critical part of a prospect's journey to becoming a customer, and it falls in between the second and third stages of the larger inbound marketing methodology, which you can see below. Sometimes referred to as “drip marketing,” lead nurturing is the practice of developing a series of communications (emails, social media messages, etc.) that seek to qualify a lead, keep it engaged, and gradually push it down the sales funnel. Inbound marketing is all about delivering valuable content to the right audience -- and lead nurturing helps foster this by providing contextually relevant information to a lead during different stages of the buying lifecycle. While there’s some overlap with the term “lead nurturing,” marketing automation is a bit different. Think of marketing automation as the platform with associated tools and analytics to develop a lead nurturing strategy. If you’ll let me run with an “art” analogy, marketing automation is the paintbrush, watercolors, and blank canvas. Lead nurturing is the artist that makes it all come together. Like Bob Ross! You can’t paint a happy little nurturing campaign without both. Bonus: Want to get super-savvy with your marketing automation terminology? Take it to the next level with behavior-based marketing automation. Behavior-based marketing automation refers to a system that triggers emails and other communication based on user activity on and off your site. It enables marketers to nurture leads and send them information only when it is most relevant to their stage in the buying cycle. This refers to the stage that a lead enters after identifying a problem. Now they’re looking to conduct further research to find a solution to the problem. Typical middle of the funnel offers include case studies or product brochures -- essentially anything that brings your business into the equation as a solution to the problem the lead is looking to solve. Also, if you want to be cool, you can refer to this stage as “MOFU” for short. With mobile search queries officially surpassing desktop queries, now is probably the time to explore mobile marketing. What is it? Well, mobile marketing refers to the practice of optimizing marketing for mobile devices to provide visitors with time- and location- sensitive, personalized information for promoting goods, services, and ideas. The amount of revenue a subscription-based business receives per month. Includes MRR gained by new accounts (net new), MRR gained from upsells (net positive), MRR lost from downsells (net negative), and MRR lost from cancellations (net loss). A type of online advertising that takes on the form and function of the platform it appears on. Its purpose is to make ads feel less like ads, and more like part of the conversation. That means it's usually a piece of sponsored content that's relative to the consumer experience, isn't interruptive, and looks and feels similar to its editorial environment. A customer satisfaction metric that measures, on a scale of 0-10, the degree to which people would recommend your company to others. The NPS is derived from a simple survey designed to help you determine how loyal your customers are to your business. To calculate NPS, subtract the percentage of customers who would not recommend you (detractors, or 0-6) from the percent of customers who would (promoters, or 9-10). Regularly determining your company’s NPS allows you to identify ways to improve your products and services so you can increase the loyalty of your customers. Learn more about how to use NPS surveys for marketing here. A news feed is an online feed full of news sources. On Facebook, the News Feed is the homepage of users' accounts where they can see all the latest updates from their friends. (Learn all about Facebook's News Feed here.) The news feed on Twitter is called Timeline. A no-follow link is used when a website does not want to pass search engine authority to another webpage. It tells search engine crawlers not to follow or pass credit to linked websites as a way to avoid association with spammy content or inadvertently violating webmaster guidelines. To varying degrees, the no-follow attribute is recognized by all major search engines, like Google, Yahoo, and Bing. Not all links (and linking domains) are created equal, and a no-follow attribute helps avoid any foul play. This is the free-spirited cousin of on-page optimization. Off-page SEO refers to incoming links and other outside factors that impact how a webpage is indexed in search results. Factors like linking domains and even social media play a role in off-page optimization. The good news is that it’s powerful; the not so good news is that it’s mostly out of an inbound marketer’s control. The solution? Create useful, remarkable content and chances are people will share and link to it. A request to load a single web page on the internet. Marketers use them to analyze their website and to see if any change on the webpage results in more or fewer page views. The amount of money spent to get a digital advertisement clicked. Also an internet advertising model where advertisers pay a publisher (usually a search engine, social media site, or website owner) a certain amount of money every time their ad is clicked. For search engines, PPC ads display an advertisement when someone searches for a keyword that matches the advertiser's keyword list, which they submit to the search engine ahead of time. PPC ads are used to direct traffic to the advertiser's website, and PPC is used to assess the cost effectiveness and profitability of your paid advertising campaigns. Flat rate: where the advertiser and publisher agree on a fixed amount that will be paid for each click. Typically this happens when publishers have a fixed rate for PPC in different areas on their website. Bid-based: where the advertiser competes against other advertisers in an advertising network. In this case, each advertiser sets a maximum spend to pay for a given ad spot, so the ad will stop appearing on a given website once that amount of money is spent. It also means that the more people that click on your ad, the lower PPC you'll pay and vice versa. A product matrix is a chart that describes the various products a business offers and the features that apply to each product. Product matrices typically assign each version of a product its own column along the top, with the features included in each version listed in rows down the lefthand side. For example, a business that sells three versions of the same product -- and 10 potential features across this product -- could create a product matrix with three columns and 10 rows. In each cell where a column and row intersect, the business can include a symbol or checkmark indicating that this feature is included in this version of the product. Pinterest is a visual social network typically used by ecommerce marketers, but not without its fair share of top-notch B2B and B2C content marketers. Businesses and consumers alike use the website to post images and photos they like so fellow users can repin (share) that content. A contact that opted in to receive communication from your company, became educated about your product or service, and is interested in learning more. Marketing and Sales often have two different versions of qualified leads (MQLs for Marketing, and SQLs for Sales), so be sure to have conversations with your sales team to set expectations for the types of leads you plan to hand over. Today, marketers want to measure the ROI on every tactic and channel they use. Many facets of marketing have pretty straightforward ROI calculations (like PPC), but others are more difficult (like content marketing). 1) You can retweet an entire tweet by clicking the retweet button, indicated below. 3) You can post a new tweet that includes your own commentary in addition to the information you're retweeting. The formula is this: Your own commentary + RT + the original tweeter's Twitter handle + colon + the exact text from their original tweet. This method of retweeting allows you to add your own thoughts, but with a very limited character count. The practice of enhancing where a webpage appears in search results. By adjusting a webpage's on-page SEO elements and influencing off-page SEO factors, an inbound marketer can improve where a webpage appears in search engine results. For marketers, an SLA is an agreement between a company's sales and marketing teams that defines the expectations Sales has for Marketing and vice versa. The Marketing SLA defines expectations Sales has for Marketing with regards to lead quantity and lead quality, while the Sales SLA defines the expectations Marketing has for Sales on how deeply and frequently Sales will pursue each qualified lead. SLAs exist to align sales and marketing. If the two departments are managed as separate silos, the system fails. For companies to achieve growth and become leaders in their industries, it is critical that these two groups be properly integrated. Learn how to create an SLA here. Usually defined as companies that have between 10 and 500 employees. A social app that allows users to send and receive time-sensitive photos and videos known as "snaps," which are hidden from the recipients once the time limit expires. (Note: Images and videos still remain on the Snapchat server). Users can add text and drawings to their snaps and control the list of recipients in which they send them to. Social media is media designed to be disseminated through social interaction, created using highly accessible and scalable publishing techniques. Facebook, Twitter, YouTube, LinkedIn and Google+ are examples of social media networks that one can join for personal or business use. Social Media is a core component of Inbound, as it provides marketers with additional channels to spread reach, increase growth, and reach business goals. For the sake of creativity, I’ll define Twitter in 140 characters or less: "Twitter is a platform that allows users to share 140-character long messages publicly. User can follow one another and be followed back." There you have it -- a tweetable definition of Twitter. A person who visits a website more than once within a period of time. Marketers use this term in contrast with overall site visits to track the amount of traffic on their website. If only one person visits a webpage 30 times, then that web page has one UV and 30 total site visits. This is short for Uniform Resource Locator. I honestly didn’t know that before writing this definition. Basically, this is the address of a piece of information that can be found on the web such as a page, image, or document (ex. http://www.huspot.com). URLs are important for on-page SEO, as search engines scour the included text when mining for keywords. If a keyword you’re looking to get indexed for is in the URL, you’ll get brownie points from search engines (but no real brownies, unfortunately). The overall experience a customer has with a particular business, from their discovery and awareness of the brand all the way through their interaction, purchase, use, and even advocacy of that brand. To deliver an excellent customer experience, you have to think like a customer, or better, think about being the customer. Learn more here. A type of interface that allows users to control a software application or hardware device. A good user interface provides a user-friendly experience by allowing the user to interact with the software or hardware in an intuitive way. It includes a menu bar, toolbar, windows, buttons, and so on. Learn how to create a user-friendly website registration process here. This term is used to describe a piece of content that has become wildly popular across the web through sharing. Oftentimes, folks don’t know a piece they’re creating will be viral until it actually does, which is usually unfortunate if it’s particularly embarrassing. A website is a set of interconnected webpages, usually including a homepage, generally located on the same server, and prepared and maintained as a collection of information by a person, group, or organization. An inbound marketer should structure a website like a dynamic, multi-dimensional entity that can be used to attract relevant website visitors, convert those visitors into leads, and close those leads into customers. Otherwise, it’s just a brochure -- and let’s be honest -- could you really use another brochure? A workflow is another way to describe a lead nurturing campaign. It’s a set of triggers and events that move a lead through the nurturing process. A workflow can also serve other purposes, such as adjust contact properties on a lead record based on certain conditions, or adding a contact record to a certain list. Regardless of how you use it, workflows can be a very powerful asset in an inbound marketing strategy. We couldn’t leave “X” out of the party! An XML sitemap is a file of code that lives on your web server and lists all of the relevant URLs that are in the structure of your website. It's kind of like a "floor plan" for the site, which especially comes in handy whenever the site gets changed. It also helps search engine web crawlers determine the structure of the site so they can crawl it more intelligently. YouTube is a video-sharing website on which users can upload, share, and view videos. Three former PayPal employees created YouTube in February 2005. In November 2006, YouTube, LLC was bought by Google Inc. for $1.65 billion, and is now operated as a subsidiary of Google. YouTube is the largest video-sharing site in the world and you’re probably on it now instead of finishing up this post. We couldn’t think of anything for "Z." So I ask you dear readers: What inbound marketing related topic should we define that begins with the letter "Z"?